Plan your next party in our VIP area! 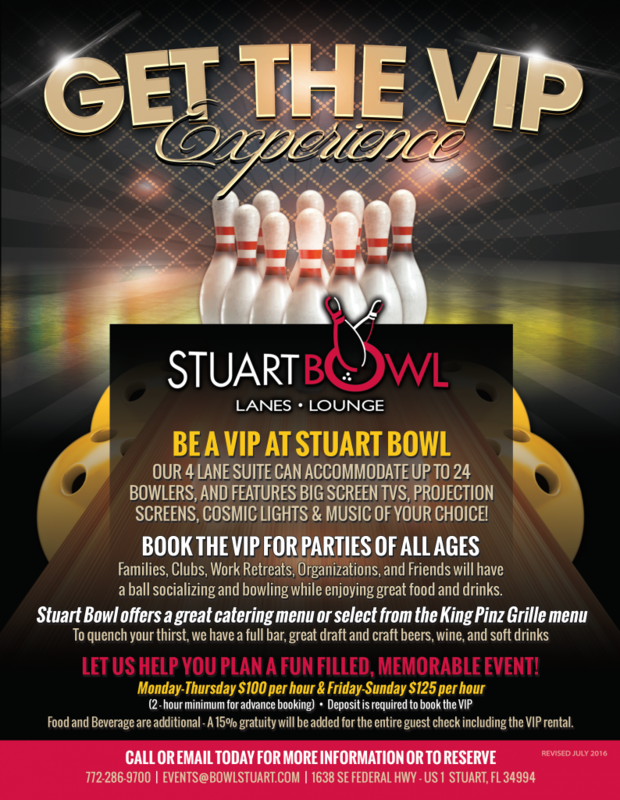 Our 4 lane area can accommodate up to 24 bowlers, featuring big screen TVs, projection screens and music of your choice! Book the VIP area for family parties, clubs, or just friends! We have a great catering menu, or order from the King Pinz Grille menu. Our full bar includes great draft and craft beer, wine, and soft drinks. Pricing is just $100 per hour Monday – Thursday or $125 Friday – Sunday. Give us a call today to reserve your spot now! Planning a birthday party for yourself, a spouse, or friend? We guarantee that you’ll have a great time at a party in our facility. You can also give us a call at (772) 286-9700.